A&E Construction provides innovative solutions and attractive designs to satisfy all of your remodeling needs. Our team regularly collaborates to design and construct unique home improvement projects that serve the particular needs of each client. Whether you are looking to modernize your living room, make your mudroom more functional, design a custom closet fit for Hollywood, or create a cozy reading nook under a window, A&E Construction will support you through all phases of design and construction to ensure that you achieve all of your home remodeling goals. Check out examples of our highly customized work below. This living room and entryway remodel was part of a larger full-home interior remodel during which we gutted the interior of the home in order to construct the new, contemporary interior seen above. This design features a custom asymmetrical fireplace with stone accent tile, custom wall paneling, and accent soffit lighting to highlight the space. This custom wall unit includes both plenty of drawers and cabinet space for storage, and also a cozy window nook that's perfect for putting on shoes, or even settling in to read a book. Contact us today if you would like us to design and construct your own custom built-ins to fit your specific needs. These two girls bedrooms feature various types of custom built-ins, including desks, bookcases, and window seats. These kids bedrooms are for sisters in the same household, shown in coordinating pink and green color schemes. A&E Construction can work with you to develop the customized, attractive and functional bedroom designs that you are looking for. A custom built-in for your mudroom/laundry room can transform the way you use this space. See above how a built-in washer/dryer can create a finished look, and provide plenty of folding room with a new countertop. This media lounge is a good example of how A&E Construction can make any alcove of your home attractive and functional. See how striking accent lighting can add character to a space. 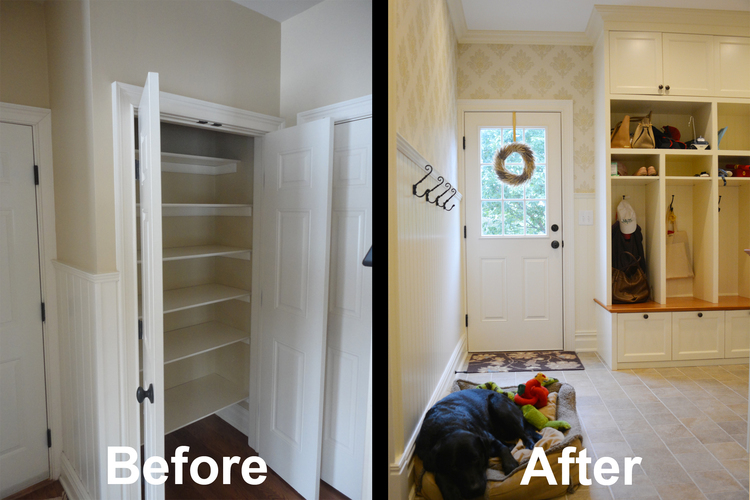 This mudroom renovation provides individual storage cubbies for each member of the family in a way that is not only organized and functional but also attractive. This custom media unit was designed and constructed by our woodworking specialists to provide a handsome home for this family's television and media consoles. Custom built-ins, paneling, or a faux fireplace can add character to your sitting room or living room. A&E Construction's craftsmen have the skill and expertise to give you the customized look that you want. 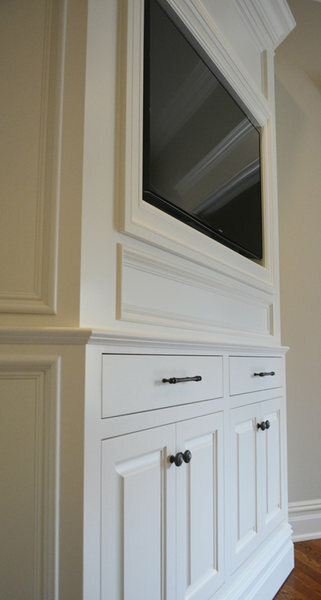 This is an example of a custom built-in that A&E Construction designed and fabricated in order to house this client's television and various media consoles. With a large family, it may seem impossible to keep a family room organized. However, A&E Construction can provide you with the custom storage and shelving solutions that you need to keep certain clutter hidden while still being able to showcase the photos and objects you love. Fresh new built-ins with crown molding details are the type of feature that set A&E's custom living rooms apart from the rest.